A lot of my work is actually done online – responding to and sending emails, accounting, managing schedules, marketing, etc. There also needs to be someone physically there in my office, overseeing things and handling things on site as they come up. I have set things up for the summer so that there is always someone physically there in my place. That way, I can come and go from work somewhat freely, do a lot of work from home, and spend time with my kids. A week into summer vacation and I’m already learning that working from home is not as easy as it sounds! I definitely maxed out on the number of times I could hear “Mama?” today, whilst trying to concentrate on work. I feel awful saying that. Can we please just ration out the queries? Would you rather eat poop flavored ice cream, or ice cream flavored poop? This is an important question one really needs to carefully weigh before being unexpectedly thrown into a situation in which there is no time to give this proper thought. Okay, here’s the truth…even when I’m not a work, my business is my third child. A piece of my mind and my heart is always there, from the time it opens, until the time it closes. I have the most wonderful people working there, and I am incredibly grateful for that. Nevertheless, I am ultimately responsible for everything (meaning not that I do everything, but that if anything were to go wrong, it falls on me). This is something I never take lightly. So, it seems impossible to give the amount of attention I would like to give to each of my [three] children…and yet, here we all are, about to spend two and a half months together. (…and then it will be gone…whoosh…just like their childhood – I KNOW!). I feel so incredibly blessed to have the flexibility that running my own business affords me. I’m just saying (whining?) that it isn’t entirely easy. 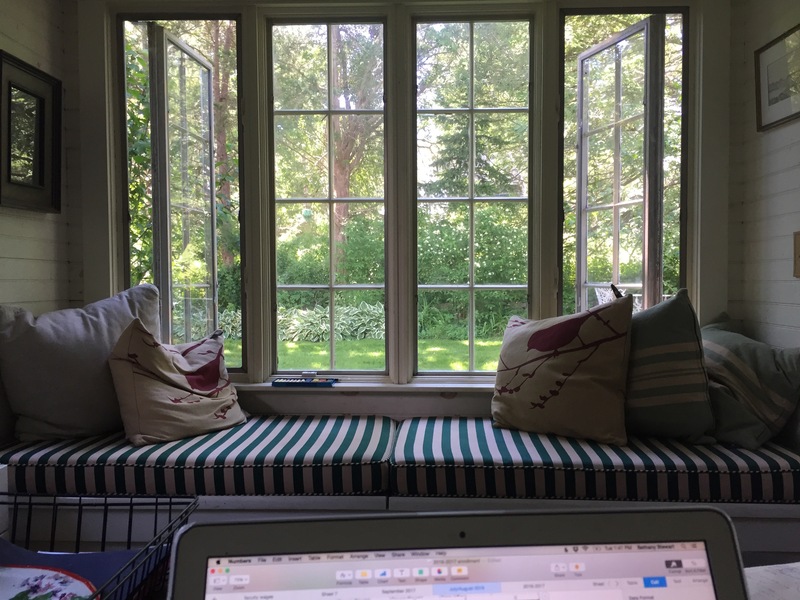 The hard thing about doing work at home is not only the difficulty in concentrating, but it is feeling as though you are ignoring your kids, brushing them off, and maybe even getting annoyed when they really need to ask important questions. My kids are eight and ten, old enough to understand when I’m trying to do work – but they are still kids! They want my attention, they have short attention spans and they can’t help but feel like they are being ignored…and who likes that? So, how do I survive a summer of being a full-time mom and a business owner? First, I have to give myself a break. I cannot “take the summer off” to be with my kids. I just can’t. I am a provider. It is my livelihood. It is my responsibility. It is my third child. When I get frustrated about snapping at my kids after the 100th “Mama?” inquiry while I’m just trying to finish this one thing, I need to let myself off the hook. I am lucky enough to be able to give them A LOT of my time. We will need to find a rhythm. I will need to do some work at night. I will need to lean on my own “Mama” to help me (thank GOD for her) and a couple of dear friends. Sometimes, my children will have to wait for my attention. Sometimes I will be distracted. Sometimes I will simply close the computer and say YES to the board games, YES to the endless queries…YES to being present with my beautiful girls. I hope someday they will look back on their childhood and realize how hard I worked to orchestrate this beautiful life we live. I hope they will remember that we spent our summers together, and not that I sometimes dragged them to work with me, or shoo’ed them away before giving them the answer to their burning questions. No, I don’t believe pirates wear underpants…and definitely poop flavored ice cream. New home office which I reclaimed from the dog. Sorry Louie.